High-quality image reproduction was one of the central ideas behind the founding of The Plant Cell 30 years ago. Those who remember the early days of the journal will no doubt recall the novelty of a scientific journal printed on heavy weight glossy paper. The ability to capture and faithfully reproduce images obtained from living organisms, from single cells—increasingly, even single molecules—to complex tissues to whole plants and even populations of plants with remote sensing and thermal imaging, and to create images—graphs and plots—that facilitate our comprehension of data obtained by other means, is vital to any scientific endeavor. The goal of scientific research is increased knowledge and understanding, but frequently it also reveals the astonishing beauty of our world. We invite our readers to submit their favorite images from The Plant Cellover the past 30 years. Images will be accepted until March 31, 2019. Journal staff and leadership will select images to be displayed in an online picture show, and several images will be displayed as a poster at Plant Biology 2019. Selection will be based on the scientific significance and aesthetics of the image. 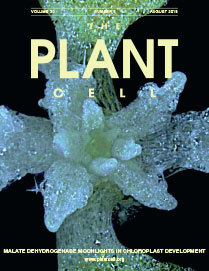 For more information visit plantcellbestimages.aspb.org.